Now my following dilemma. This is 100grams spun. 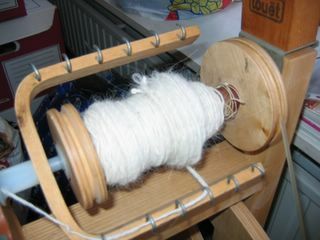 Now I'm thinking of spinning 100 grams of the grey alpaca and plying the white one with the grey one, and then colour the whole thing. I have a love for colouring mixed fleeces/yarn as it gives a nice shading of the yarn, but of course this isn't really mixed and I'm not sure how it'll turn out. I would love to card the grey one with the white alpace before spinning, but I don't have a carder and the only one available in Belgium is handcards. Or maybe I can find another one, but I'm not sure I can afford it right now. :( I just don't know. Any opinions? As for the second Dublin Bay sock, it's coming along nicely and I can't wait to finish it up! Due to the hot weather over here (over 35°C) I decided to skip horse riding tonight (It would be to hot for both the horse and me, and the horse is having a fun time at the maedow, and he's going into a 2 months training session next week so he can have some time off) and I thought about knitting, but I was to tired from the heat. Yes, I do get tired from the heat, especially from sitting in an extremely hot train without airco (for the rest of the day I had been wearing a tin sweater and I felt ok but in the train it was just to hot). Not sure yet what to do. I want to design the "little-things-holder" as well, which will be holding my tapestry needles and crochet hooks etc. to put in the bag with my socks. To weave in ends and such. But I'm not sure I'll manage it this weekend. Tomorrow I'm getting up extremely early to go horse riding (I'm thinking 7 which is extremely early for me during a weekend) while it's still nice and cold. Then after that I'm going to the store to get some yarn. Mostly white sock yarn to colour. I want to try the dyes I bought over here. Plus I hope I can find black sock yarn. With the left-overs of the handdyed yarn I'm using now for the Dublin Bay socks I want to do some kind of slipped stitch sock thing. I'm not sure yet about the pattern. It'll either be slipped stitch or intarsia, but I have to try the last (and probably the first) with some of the acrylic I have laying around. And I don't look forward to knitting with acrylic now in this hot weather, somehow wool feels better then acrylic. I should really be knitting with cotton but I don't like that. Speaking about cotton, I found a knitting mag at the store today, which is exceptional as there aren't much knitting magazines around here. Now I do like some of the patterns in it but all of them are in cotton and somehow I don't like knitting with cotton. But I don't know how to substitute yarns properly. Maybe I'll ask the lady at the LYS I like going at. Or I'll try cotton again. Not sure yet. There are 2 patterns I really, really like. Hmm, really difficult! Yesterday I got the addi needles that didn't make it with the last order I did. They weren't in stock. It's the 2.5mm DPNs with needle huggers (so cute!). I'm really into my circulars now but I still use the DPNs for the heel turns plus for baby/children socks. More dissapointing is the order that still didn't make it. It's the Jacquard Acid dyes and some knitting books. I really, really want the knitting books but I have no clue if the package will ever make it. :( Very depressing. I'm already planning the next sock but I've seen so many great free patterns (and I've seen great socks in not so free patterns, I whish I knew where to get the patterns but most are from old mags or so - and with old I mean like from 2004 - and as I can't get the magazines here in the first place I really don't feel like spending a ton on ordering them just for the socks). Well, first up are the socks in the sock yarn I deyed myself. I want to see how the stripes come out. Then there's the self striping sock yarn I want to try with 2.5mm (I'm trying it now for boyfriend with 3mm and I don't really like it but will finish the socks no matter). And then there are the cable socks I want to try. So not sure yet what will be cast on after the Dublin Bay socks. Oh, there are a few more sock books I want to order but I'm thinking about trying to get them at a local store which orders US books straight in the US and so I can get them at a decent price. They've done this before for me and it's more reliyalbe (sp? I really can't figure out how the spell this though I know this is wrong) then ordering online. The post system is just so fucked up! Today they published in the newspapers that the complaints about the Belgian postal system for 2004 are 1/2 higher then the ones for 2003! Shows how fucked up the system is! Ok, I'm off now, to watch some tele, do some knitting, open up some windows (it's getting dark so it should be cooling down now ...). Ps. : How come this hot weather always makes me feel even more lazy? Luckily the temperatures are going to drop again big time after the weekend. Crazy? Yeah, I am, though I can stand this weather quite ok I don't really like it. Most people will kill me, but hey, I'm strange and I'm not going to change! the yarn looks like cotton candy - all fluffy and lovely. its been hot here too, but i welcome it. i love taking a book outside and lying in the grass, or better yet, taking my knitting out and knitting in the sun.